Unless you’ve been living under a rock for the last year you’ll have rocked down to Woolloongabba’s Electric Avenue. 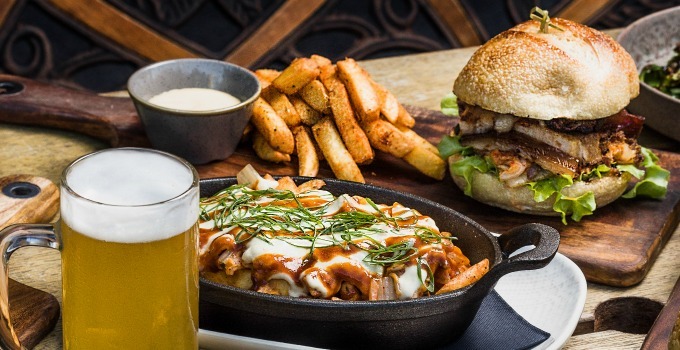 Known for their killer whisky and cocktail line up they’ve also kicked off 2018 with a new-look menu that’s pumping out some of Brisbane’s best gastro pub food at Electric Avenue. . Not your usual standard schnitty, step into the heritage-listed building and enter a hidden wonderland of eats, every day of the week. It’s time to replace that bowl of peanuts with duck rillette, baby. Feeling a little dusty after Monday’s mayhem mate? You’re not 18 anymore! Tuesday is your boy with 25% off mains to the rescue. Don’t gnocchi the veg option with brown butter and sage ricotta gnocchi, or go the whole hog with a 300g pork loin. Get over hump day and load up on finger lickin’ good vibes with $10 share plates like chicken wings with spicy Korean sauce, Sichuan fried calamari with and kimchi loaded fries with fondue sauce. It’s Friday eve (basically the weekend, right?) and it’s time to take your cutie out for a good time. Get cheesy over cheese boards or cosy up with a charcuterie board and a glass of wine. Sweeten the deal with dessert and make eyes over chocolate mousse and lemon tart – all for $40. Uber anyone? Breathe a sigh of relief, it’s the freakin’ weekend and it’s time to let your hair downnnn. Shimmy on in for Happy Hour between 4-6pm, and heck – grab some dips with house-made Country Loaf or snack up on bar nuts. Have a few cocktails and book your birthday in one of the four private rooms and then sneak through the wardrobe (if you can find it!) and into Jack Rabbits for a cheeky nightcap. No matter the day, your function needs or your heart’s desire – there’s a dish or a space with your name on it. Keeping the G&G up to date with all the latest tasty tidbits requires a lot of double lattes and espresso martinis, so we occasionally need to give out some sponsored love. But rest assured that we only work with businesses that we think are really nifty, as the sponsor for this post is! - the gourmand who doesn’t trust herself not to get stuck in the magic wardrobe.